Very competitive – contact Amanda for more information. Experience life in one of the world's most exciting cities! As Chinese residents and the ever-expanding expat population seek improved healthcare services, our client plans significant growth over the next few years to meet this demand. If you are an adventurous doctor, seeking a new challenge and would like the opportunity to fast-track your career in an emerging market, please do get in touch. 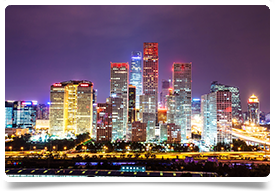 Relocation services including flights, accommodation in China on arrival, employment pass, etc. PLEASE NOTE THAT APPLICANTS MUST SPEAK AND WRITE ENGLISH AT A FLUENT LEVEL (any Chinese dialects will be considered advantageous). Arranging a position overseas is exciting, but we understand that it can also be a complex and time-consuming process. We’re the UK's specialist in international medical recruitment and have helped many doctors relocate. We know it’s important to balance career opportunities with lifestyle, so we’ll talk through your plans and get to know you to make sure we find the right role in the right location.